Ted and Sandra Andrews wanted less travel and more philanthropy from their work lives. So, five years ago, they chose a mobile franchise, Kona Ice, and have never regretted their choice. Besides the "give-back" to community organizations that their business allows, they're happy with the model itself: They can market the business, while earning a profit, simply by stopping at local soccer games to connect with people in the community and gain bookings. They enjoy a competition-free business segment. And they particularly like the "camaraderie" they've found among their fellow franchisees. "Getting involved with Kona Ice has been one of the best decisions we have ever made," Ted Andrews reports. Kona Ice of Northeast Cincinnati and Dayton has been in business for five years. We are in our sixth season with the brand. We currently own three Kona Ice Trucks, two Kona Ice Minis (an exact miniature replica of the truck, which can operate indoors) and a Kona Ice Kiosk. In the summer of 2009, we began exploring franchise opportunities. I wanted an opportunity to spend more time with my family and have a greater impact on my community. Likewise, Sandra was preparing to return to work, since our children had become old enough to care for themselves. We were both hoping to launch a business that would bring us closer to our family, friends and neighbors in the area. That October, Sandra discovered an article about Kona Ice in our daily newspaper. While we were attracted to the business model, we did not want to begin selling shaved ice heading into the winter. In March of 2010, we found another story about Kona Ice in our daily newspaper. With the warm weather months approaching, we decided to move forward with the investment. We drove down to Florence to connect with the Kona Korporate team and taste our first Kona Ice. In late April of 2010 we bought a new truck and soon afterward bought a second truck from an existing operator and began changing lives here in Northeast Cincinnati and Dayton. Getting involved with Kona Ice has been one of the best decisions we have ever made. Prior to launching our Kona Ice business, I was a regional director with Starbucks and Wild Oats. My role included enhancing district communication and education through innovative bi-weekly conference calls and meetings. I played a key role in improving overall performance, in a district comprised of challenging stores. My role required extensive travel, which is one of the reasons I decided to transition to business ownership. Sandra was the primary caretaker for our two children. Before leaving her corporate career to start a family, she served in key administrative roles with several large companies in the area. Like me, Sandra was eager to leverage her skills and experience to have a greater impact on our community. We were excited to get involved with Kona Ice in the early phases of an aggressive growth period. We quickly connected with the home office team and neighboring franchisees. To this day, we regularly meet with franchisees in our region to discuss strategies and best practices, as well as share business opportunities. This past winter, we teamed up to raise nearly $7,000 for the Greater Cincinnati Leukemia and Lymphoma Society. There is a true sense of camaraderie within the franchise network. The Kona Ice truck allows us to market the business, while earning a profit. Simply driving down the street or stopping by a local soccer field allows us to make connections with people in the community, which has led to key bookings and lasting relationships. We are now in our sixth season and growing by more than 60 percent without any formal advertising program. Moreover, Kona Ice does not have any direct competitors, creating the ideal conditions for us to expand quickly throughout Northeast Cincinnati and Dayton. The opportunity to grow and succeed at an accelerated rate, combined with the brand’s fixed royalty fees, has always been a major selling point. There is a great deal of guided autonomy in the Kona Ice franchise business, allowing us to flex our entrepreneurial skills as franchisees -- something that many other franchisees don’t have the opportunity to do. The start-up investment fee to own a Kona Ice business is $104,650, which includes the $15,000 franchise fee and the $89,650 truck. 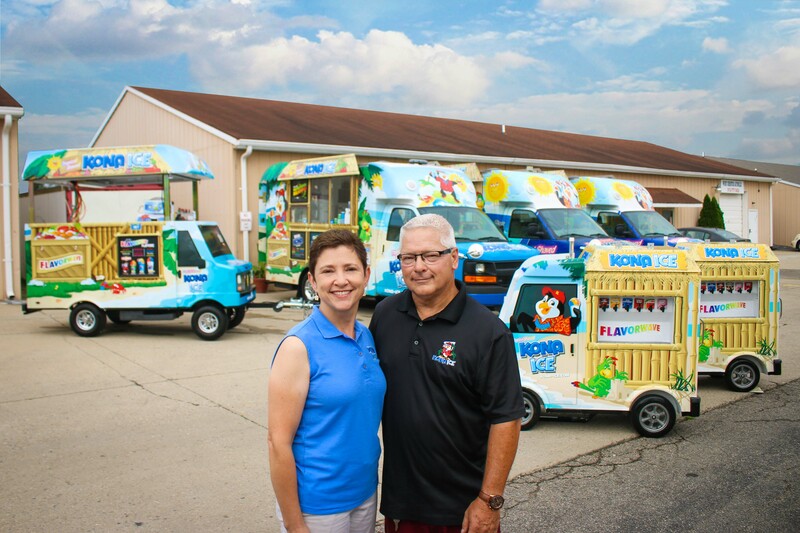 Kona Ice offers a range of financing options for interested franchisees. Three decades of experience in the retail industry has given me the skills to succeed with Kona Ice. Squeezing out 3 percent sales increases in a competitive, high-pressure situation gives me confidence that I can continue to drive growth for our mobile franchise. Likewise, Sandra excels at cultivating relationships, marketing the business and scheduling bookings. She also manages the finances, which is one of the most essential roles in building a business. Most, if not all, businesses and franchises spend a great deal of time attempting to expense their way to profitability. Kona Ice’s low food costs give us the freedom to focus on building sales and impressions. Since the business has grown so quickly, we needed to decide whether to pay off our debt or invest in another truck. This is a decision that we needed to address early on. In addition, we have had to become more selective about booking events. We are invited to more functions than we are able to service. We want to maximize our opportunity to attend as many events as possible, while being conscious of which events will allow us to have the greatest impact on our community. I would advise prospective franchisees to keep an open mind. I wouldn’t recommend choosing a franchise based solely on your personal or professional background. We had little experience in the mobile food or frozen dessert industry. Similarly, we didn’t have any experience with several critical aspects of the business, such as school and community partnerships and fundraising. We took a risk and chose a business that would allow us to have fun, for months and years to come. We look forward to coming to work every day and would advise others to find a business that allows them to do the same. Looking ahead, we want to spend less time at events and more time managing and directing our philanthropic efforts. We plan to become more involved with our local chamber, BNI Group, PTO and other professional organizations. Furthermore, there are tremendous growth opportunities for us within our territory. We could easily add another truck or two. We are hoping to expand the business and increase our overall community give-back figure. To date, we have donated more than $190,000 to schools, youth sports leagues and community organizations through Northeast Cincinnati and Dayton. We can’t wait to triple these efforts in the next five to ten years.